To receive Port Orleans news updates directly to your own computer, please subscribe to our free RSS News Feed, or follow us on Facebook or Twitter. 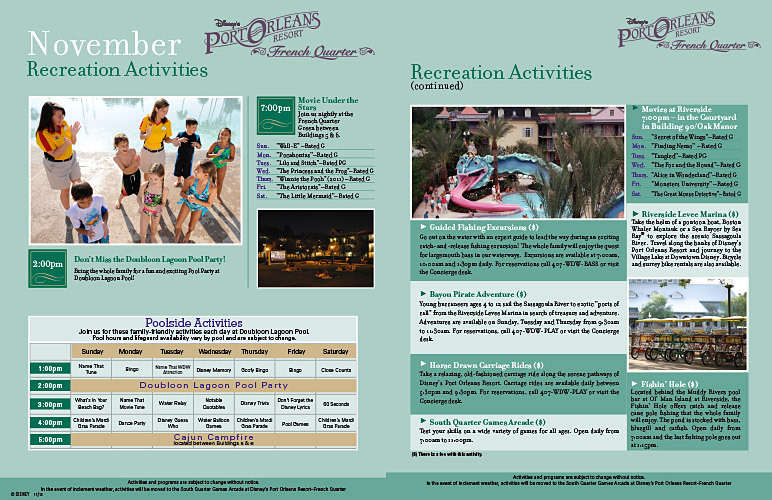 The Port Orleans French Quarter swimming pool, Doubloon Lagoon, will be closed for refurbishment from mid-January until the end of February 2014 (which includes the busy President's Day week). The dates are tentatively 13 Jan - 28 Feb, but that may change slightly depending on how long the work eventually takes. Disney will be running a free shuttle service between POFQ and POR during the closure to allow guests to use any of the six Riverside pools in the meantime. The POFQ hot tub will also be closed for some of the time, but not necessarily for the whole of the refurbishment period. The laundry and kids playground will remain open, but the Mardi Grogs pool bar and the restrooms will be closed. Update on 28 Jan: Rather than running large shuttle buses from the front of the hotels, they are using the small 'golf-cart'-like pargo vehicles to take guests from the front of the pool area at POFQ directly over to the pool at Riverside in a few minutes. Very little hanging around, just hop in and go. Return trips are just as easy. Update on 27 Feb: The POFQ pool is due to re-open on Tuesday 4th March. As from November 2013, the POR and POFQ feature pools (i.e. Ol' Man Island and Doubloon Lagoon) will both have extended lifeguard operating hours of 9am-11pm. However, outside of those times both pools (including the hot tubs) will be fully CLOSED and guests will not be allowed to use them - so sadly no more midnight soaks in the hot tub after a long day at the parks. Off-season (e.g. 5 January - 15 February 2014, but dates are subject to change based on demand and other factors) the feature pool and hot tub hours will be reduced to 9am-9pm. The five quiet pools around the Alligator Bayou and Magnolia Bend areas of POR will still remain available for swimming at any time outside of these hours (at your own risk of course), it's only the main feature pools which will have restricted access times. Touringplans.com, the web presence of The Unofficial Guide to Walt Disney World guidebook, has just unveiled a superb new resource for anyone planning a trip to Port Orleans (and many of the other Disney hotels). They sent photographers round every single floor of every building, capturing a snapshot of the view that you will see from the window of each of the 3,000+ rooms at the resort. 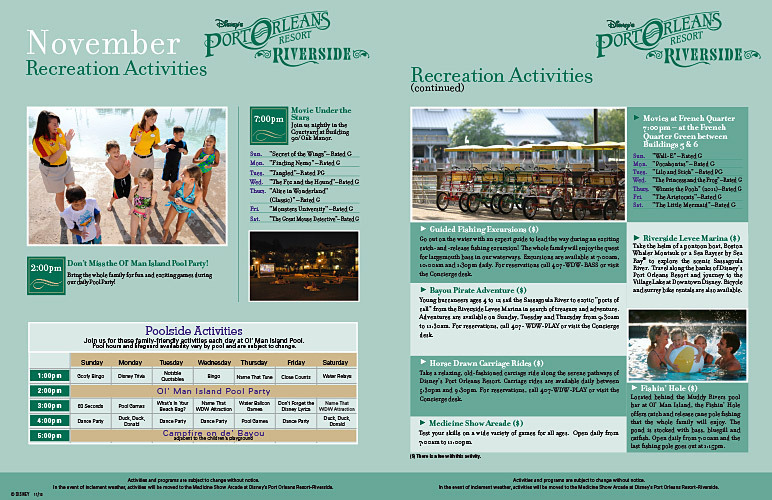 The November 2013 Recreation Activities and Movie Schedules for Port Orleans Riverside and Port Orleans French Quarter are now available. See the main Recreation Activities Schedule page for full-size PDF versions, or click on the images below. The outdoor movies will start at 7pm and the daily campfires commence at 5pm this month. The on-going issues with the replacement of fridges at most Disney resorts due to safety concerns are sadly not quite behind us yet, at least not for all guests. First the good news: If you are staying at Port Orleans French Quarter, you should now be OK. All rooms should now have working fridges installed, although staff do still need to do a 100% room audit next week to confirm that their inventory lists are fully correct. But there should no longer be any need to make special requests. Port Orleans Riverside guests, however, are not going to be so lucky. There has been no improvement at POR over the last month or so, and the number of rooms with working fridges currently stands at around 40%. About half of these are needed to help satisfy guests with medical or other special requirements (including moving fridges around between guest stays) so the 'random chance' of you happening to get a working fridge is currently only about 20%. Maintenance staff have now physically removed the old affected units (rather than leaving them in situ with a warning letter) but unfortunately the next batch of replacement fridges - which was originally hoped for around the start of November - is now looking to be nearer the end of the month. No confirmed dates are available yet, but as soon as I can let you know anything more specific I will post the information here. Remember that you can also get Port Orleans news updates automatically via Twitter @PortOrleansOrg, Facebook facebook.com/PortOrleans.org or by subscribing to the good old-fashioned RSS/email feed. 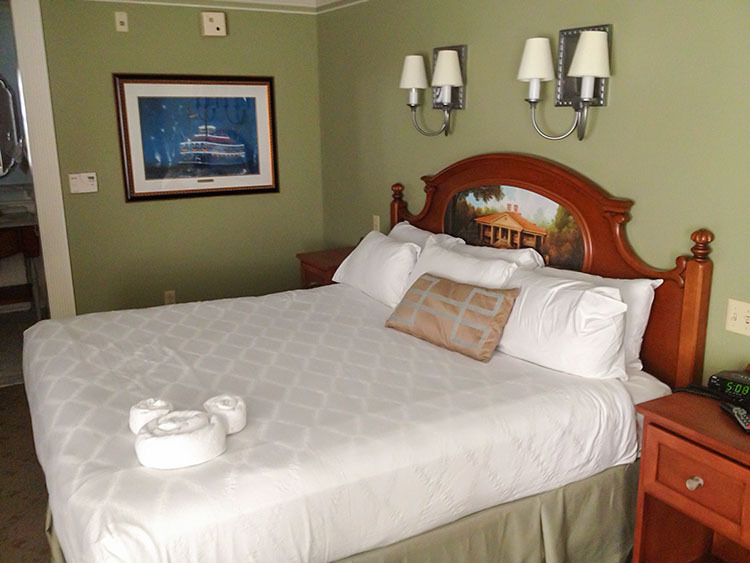 The gorgeously detailed and themed comforter bedspreads which formed so much of the initial impact of that first moment when you walk into a Port Orleans guest room appear to have been removed. 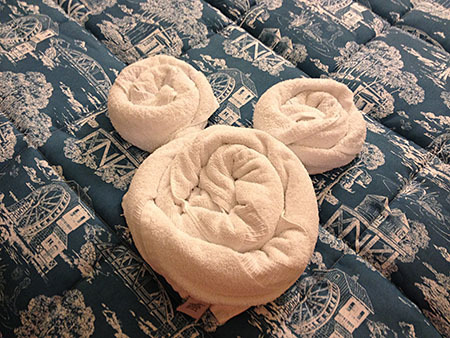 According to reports from current guests (in Alligator Bayou and French Quarter so far) there isn't even a "bed scarf" now (that strip of decorative fabric which some hotels place along the foot of their beds) to mitigate an otherwise clean & sterile expanse of 'hospital' white. Maybe it's just me, but I just don't think that a deeply themed and story-based environment such as Port Orleans is really the right place for the latest trendy fashionable hotel chain look. It also seems a real waste, given that the 3,000+ comforters were only a year or two old after the last refit. What a shame, I feel that Disney really can (and did!) do better than this. With or without a runner at some future stage, still bland.